WWE Chief Branding Officer Stephanie McMahon was a recent guest on #MaxOut with Ed Mylett to discuss the rise of the women's division, Ronda Rousey, and more. McMahon was asked about how the Women's Revolution – now the Women's Evolution – began, and she explained the one match that only lasted for 30 seconds, which sparked a hashtag that lasted for three days. McMahon also elaborated on Triple H's influence in NXT, and how that further sparked the Revolution. "It was a lot of what [Triple H] started to do at NXT, which NXT – for those of you who don't know – started off as our develpmental show, and is now really evolved into a third global touring brand in and of itself and is one of the most watched programs on the WWE Network," said Stephanie. "But my husband started to recruit elite athletes, men and women, and he started training the women same as the men and giving them the same opportunities, because – like anything else – repetitions is how you are gonna get better. "So at our live events that we do, our local live events, which is where, non-televised, our talent often learn the skills. That's where they hone the craft, the live audience gives a reaction, and that's how you learn what's working, what's not working, and worse, what they don't care about... so he started giving them those opportunities, and them our audience responded in kind. Because these women were so awesome, and they started chanting, 'this is wrestling' and 'women's wrestling'." 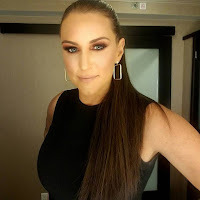 Because of this movement, Stephanie explains, the 30-second match that was shown on Raw caused fans to be outraged, due to knowing the potential of the women via matches on NXT. Thus, the #GiveDivasAChance hashtag was commenced, Vince McMahon answered "We hear you" on Twitter, and women's matches became more prominent on the main roster to the point of them headlining Raw, SmackDown, and even pay-per-views.